Today I’m working with some Cuttlebug folders and primary colors of Red, Blue and Yellow just like our GC #116 color challenge. I used Dew Drops Memento inks along with Distress inks and hand made my writing paper to look like grade school paper. 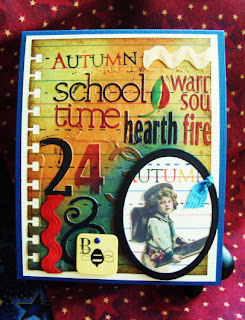 I’m not sure who graphic this is, and there is only one stamp used (Hero Arts Autumn). I’ve added some old Rick Rack and a Bee charm. Hope you are having a save and dry day out East. 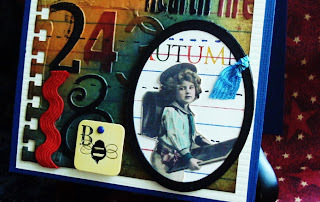 Wonderful card Vada- the handwriting is perfect- love the image you used! Vada, this is such an amazing card for BTS and primary colors! Love the image and colors and such a perfect design! Hugs! What a unique vintage looking card. The primary colours are not overpowering. oh my, the richness of colors and textures, love it! great combo! This is lovely. Great job! What a terrific card, Vada! It's so rich in color and design. You get an A+ from me Vada for this outstanding school card! What a wonderful entry for the Gingersnap Creations challenge! Stunning Vada, your use of color is fabulous!